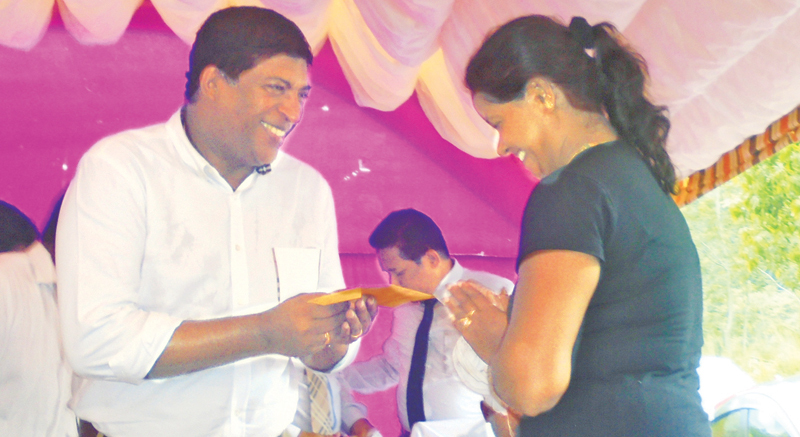 Minister Ravi Karunanayake offers compensation to an affected woman. Rs.134 million were granted as compensation for the 28 families of Popitiya whose houses were damaged due to the construction of the Broadland hydro power project carried out by the Ceylon Electricity Board (CEB) recently. The ceremony in this regard was held near the Samanala hydro power station in Polpitiya in Ambagamuwa, Nuwara Eliya under the patronage of Power, Energy and Business Development Minister Ravi Karunanayake. Minister Ravi Karunanayaka said that the affected families had requested former power ministers and other authorities many times to compensate for their damaged houses for the past four years, but they were limited only to words. "Two months ago I visited Polpitiya along with the Nuwara Eliya district Parliamenatarian K.K.Piyadasa and met the families and promised them that I would take action to compensate for their houses before the Sinhala Tamil New Year season. Today I am happy to compensate Rs 134 million for them fulfilling my pledge,” he said. Nuwara Eliya district parliamentarian K.K.Piyadasa thanked Minister Ravi Karunanayake for taking quick steps to compensate the affected families.